Vanilla Poppy Seed Cake with Whipped Ganache is three layers of ultra moist cake and pure vanilla decadence. No special decorating skills needed! Tons of tips and tricks included below. Taste: Heaps of vanilla and white chocolate flavor. Texture: The cake is ultra moist and soft, without being too delicate to stand up to the rich whipped white chocolate ganache. Ease: Very straight forward and simple! Just remember to give yourself time to chill the ganache before whipping. Pros: Fun and beautiful cake, perfect for any vanilla lover. As stressful as traveling can be, I still find it to be my greatest source of inspiration. In terms of food, design, architecture, landscape, culture, and just life in general, there’s nothing like being exposed to a different way of living. This past spring Jared and I visited my family in Perth, Australia. We also explored Sydney for a few days. It was my first time in Perth as an adult, and my first time in Sydney period (I lived in Melbourne when I was around five years old). Although the Australian culture is similar to American culture, the little differences completely intrigued and inspired me. I may have forced Jared to spend an hour with me poring over Aussie cookbooks at a bookstore. I loved it. The food and culinary styles are similar enough to American cuisine to feel familiar, but different enough to be interesting. Even the desserts! I left with a bunch of new recipe ideas, and have been experimenting with them ever since. One of the recipes I knew I wanted to make was this Vanilla Poppy Seed Cake with Whipped Ganache. Sure, there are plenty of recipes in the U.S. for poppy seed cake, but I just loved that this one took a slightly different direction by utilizing vanilla as its main flavoring, and white chocolate whipped ganache as the frosting. Plus it’s absolutely beautiful but requires no special decorating skills or equipment. I love that this recipe makes a small but tall cake. It’s so beautiful and impressive but doesn’t require a huge group of people to want to make. I love my Fat Daddio’s 6-inch cake pans because they bake beautifully, don’t stick, and clean up easily. If you don’t already have some, I would definitely recommend picking up a jar of vanilla bean paste for this recipe. It packs way more punch than vanilla extract. You could always use a vanilla bean pod as well! Be sure to use the highest quality bars of white chocolate that you can find. Ghirardelli white chocolate bars are available at most grocery stores and tastes wonderful. Do NOT use white chocolate chips. All chocolate chips have ingredients in them to help maintain their chip shape, so they won’t melt down as smoothly as chopped bar chocolate. The cake layers can be baked, cooled, and wrapped well in plastic wrap. Store at room temperature up to 1 day ahead of time, or in the freezer for up to 1 month. The melted white chocolate and cream ganache can be covered and refrigerated for up to 2 days ahead of time before whipping and spreading over cake. The assembled cake is best eaten within one day. Refrigerate to store, but serve at room temperature. 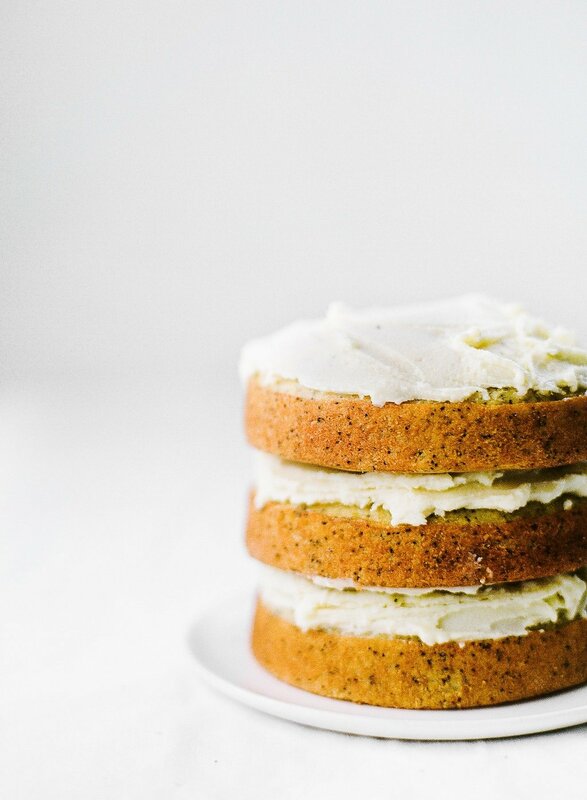 If you make and enjoy this Vanilla Poppy Seed Cake, be sure to snap a picture and share it on Instagram, tagging #handletheheat, so we can all see your creations! Preheat the oven to 350°F. Butter three 6-inch cake pans, lining the bottoms with parchment paper. In the bowl of an electric mixer, beat the butter, sugar, and vanilla paste on medium-high speed until light and fluffy, about 3 to 4 minutes. Add the eggs, one at a time, until well combined. In a medium bowl combine the flour, baking powder, baking soda, and salt. Add the flour mixture and milk in alternating batches, beating on low speed in between each addition until just combined. Gently stir in the poppy seeds. Divide the batter evenly among the prepared pans, smoothing the surfaces. Bake for about 25 minutes, or until a cake tester inserted into the center comes out clean. Let cool in the pans for 5 minutes before turning out onto cooling racks to cool completely. In a microwave-safe bowl, micorwave the chocolate and cream in 30-second bursts, stirring between each burst, until smooth. Stir in the vanilla paste. Place in the fridge for 30 minutes, or until slightly firmed. Using an electric stand mixer fitted with the whisk attachment, beat the ganache until light and fluffy. Place one cake layer on a cake stand or serving plate. Spread with about 1/2 cup of the ganache. Repeat with the remaining two cake layers and ganache. Decorate with fresh fruit or chocolate shavings, if desired. How wrong would it be if I just make the ganache and eat it with a spoon? 😉 Looks delish! I love lemon poppy seed cakes and was wondering if instead of the vanilla I can use lemon zest and juice. Whipped Ganache??? That sounds magical! I love ganache on brownies…now whipped??? Yum!!! Thank you!! LOVE this recipe, thank you for sharing it Tessa. Moist, buttery, heavenly deliciousness, and the poppy seeds lend a slight nutty flavor. Haven’t frosted mine yet – had to eat one 1st. Yearned for a cupcake for whatever reason (peeling the liner off & all) so made mine into cupcakes. Made 19 cupcakes & baked them for 18 minutes. Baked up beautifully. Brings back memories of a vanilla poppy seed cake at a special place by the lake I had once/twice growing up – definitely a KEEPER! Not sure what happened with my ganache. After whipping for 10 min it was still watery & dripped down the cake. Didn’t think it was too warm when I took it from the refrigerator. Hey Tessa! So excited to make this! Question: would you recommend this whipped ganache if I wanted to frost the entire layered cake in regards to flavor and stability? Instead of this (beautiful!) naked look?